The Girl Scout cookie program teaches young women about running a business by learning budgeting, marketing, sales, and money management. Eight varieties are being sold, but there is one flavor you won't find in South Florida. (PKG) Since 1917 the Girl Scouts have been helping people fail at their New Year's dieting resolutions by selling their delicious cookies. "You can still help out by donating for our cookies for the Military program," says Melinda. Melinda says the troops say it's one of the top things they like to get, "It's that Americana classic that they like to see." Yesterday, as I waited impatiently for Melinda Glasco and Allyssa Sophie from the Girl Scouts to deliver bags and bags of cookies to WPTV. I was excited to try the new Caramel Chocolate Chip cookie I read about online. I helped the ladies pass the cookies out to the staff and Melinda had some tips. Thin mints are tastiest when stored in the freezer, tagalongs in the fridge, and the smores... "About five seconds in the microwave and they kinda taste like they've come from the campfire," says Melinda. But as Melinda handed me my bag... Gasp... There were no Caramel Chocolate Chip cookies; only one city in Florida will be getting this treat. You see, it turns out there are two bakers of Girl Scout cookies, ABC and Little Brownie, and out of the seven councils in Florida, six use Little Brownie. Only Orlando uses ABC so while visiting the theme parks; you can pick up a box at stands in front of your favorite stores. (ANCHOR) Girl Scout cookies go on sale January 24 through February 17. And this is the last year to pick up Savannah smiles as they will phased out. Tuesday night was a spectacle at the debut of Get On Your Feet! now playing at the Kravis Center . 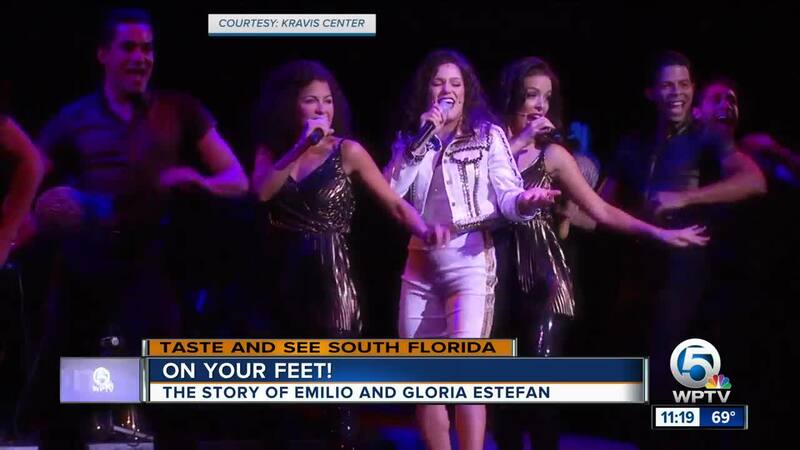 That's because South Florida's Emilio and Gloria Estefan were on hand to check out their touring Broadway musical about the struggles of their lives and their rise to stardom. Just getting off a New Year's Eve cruise with 46 of her family members, opening night at the Kravis Center was extra meaningful for Gloria Estefan. The oldest of the mom's friends is 95-years-old. The group even gave her a gift which she used for opening night. "They gave me this purse," beams Gloria" They were all friends in Cuba and they worked together.. in school." Gloria's mom's relationship with the ladies is represented in the musical and you see how meaningful the friendships were. On Your Feet! literally had a normally stoic Kravis audience up and dancing on their feet. A house normally known for leaving early at the end of a show to get to the valet first stayed to the end. It was a packed house and the energy inside was electric. The story is about the struggles Emilio and Gloria Estefan had in the music business before they were famous. "When people would tell us this music will never work, we go, 'oh, yes it will' because we've seen it with the people in South Florida, our home," says Gloria. "You have a lot of emotions, a lot of dreams, this show is about dreams for minorities that you can achieve anything in this country, and I think people realize that and I think tonight you're going to have a lot of dancing and a lot of crying," says Emilio. Gloria says the musical is true and based on real life except for one thing. "Everything up there is true, except maybe the six-pack on Emilio," teases Gloria. Gloria is no stranger to the Palm Beaches. "I actually used to spend a lot of time as a kid in West Palm because my cousin Lourdes grew up here. So I have very fond memories. To have this show opening here tonight, and sold out every show, is really very special," says Gloria. Guys, there are just a few tickets left. To get the best deal, go to Kravis.org. Last night we got to go to an after-party with the Estefans and let's just say it was a party for sure.